Star Wars Fangirl Apparel from Her Universe to be Offered for the First Time at Star Wars Weekends at Disney’s Hollywood Studios theme park. LOS ANGELES, CA – Returning to Star Wars Weekends at Disney’s Hollywood Studios theme park in Lake Buena Vista, Fla. as Celebrity Host of “The Clone Wars: Behind the Force,” actress Ashley Eckstein (voice of Ahsoka Tano on Star Wars: The Clone Wars) will also be bringing an all-new, unique range of Star Wars fangirl-focused products to the month-long event at Walt Disney World Resort. Available for the duration of Star Wars Weekends 2011, Eckstein’s line of Her Universe apparel and accessories was created as a response to the ever-increasing demand for fashionable “geek chic” products among the growing community of female fans. In addition to a product line that already includes female-focused shirts and undergarments, Her Universe will be premiering two new shirt designs at this year’s Star Wars Weekends event. 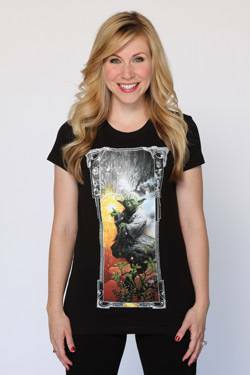 Featuring images of Jedi Master Yoda and other famous characters from the beloved Star Wars Saga, both designs will be offered in female sizes with female fits – and, for the first time ever, two popular Her Universe designs will also be available in children’s sizes. The new designs will be available exclusively for a limited time at Disney’s Hollywood Studios during Star Wars Weekends 2011. In addition to regular autograph signings each weekend, Eckstein will also be available for special merchandise autograph signings each day inside the theme park where her exclusive Her Universe apparel will be sold. Running every Friday, Saturday and Sunday from May 20 through June 12, Disney’s Star Wars Weekends is an annual event at Disney’s Hollywood Studios theme park celebrating the Star Wars Saga, as well the animated television series Star Wars: The Clone Wars. In addition to offering fans a unique opportunity to join Jedi Masters, Sith Lords and Star Wars celebrities for special shows, presentations and memorabilia, the 2011 event also marks the launch of the all-new Star Tours attraction: Star Tours –The Adventures Continue. For more information on Star Wars Weekends, visit: disneyworld.com/starwarsweekends or disneyparks.com/blog. For more information on Her Universe, visit www.heruniverse.com or contact dmadsen@araca.com.